Residents packed the Chester County Commissioners' boardroom to voice support for keeping the Pocopson Home county-operated. WEST CHESTER — In its early years, the Pocopson Home served as a point of profit – as well as pride – for Chester County. But for more than a decade, the 275-bed nursing facility and geriatic center has bled red ink, prompting periodic discussions about privatization. Last night, in the Chester County Commissioners’ boardroom, an impassioned standing-room-only crowd echoed variations on the theme that the Pocopson Home is a county operation of unparalleled value. Barry, who works at Pocopson, said she was inspired to become a registered nurse by her mother, a former resident at the home. Located in Pocopson Township – reportedly named for the Indian word meaning “roaring waters” after the stream that flows through it – the home has generated roaring controversy whenever the county has considered relinquishing control of it, a pattern that continued last night. Among the speakers were Joanne Jones, president of Premier Healthcare Resources; Ann Feldman, a Downingtown Borough Council member; and Alan Larson, administrator of the Pocopson Home. All three county commissioners stressed that no decision on the home’s fate has been made, and more public meetings will be scheduled to discuss its future. Premier Healthcare Resources, a King of Prussia firm, was contracted months ago to prepare a strategic plan and financial analysis, which its president, Joanne Jones, outlined before the commissioners opened the floor to public comment. Members of the audience of about 250 included about a dozen Pocopson Home residents, some of whom occupied wheelchairs in the room’s front row. All of the speakers emphasized that any changes would endanger a beloved institution that has provided a lifeline to many. 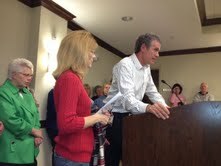 “We don’t need any changes,” insisted Betty Decker, a resident who spoke from her wheelchair and elicited loud applause. The majority of residents who addressed the commissioners said they based their opinions on experiences at other facilities. “This is the one that when I say ‘good night,’ she doesn’t say, ‘Take me out of here,’” said Gail Williams, describing her 100-year-old mother. Richard Stiles, an emergency-room physician at Chester County Hospital, said he sees patients from a variety of facilities. “The quality of care is not the same,” he stressed, adding that “when we privatize, something has to give” because you are forced to do more with less. Commissioner Kathi Cozzone said the board received calls and emails from many residents who could not attend last night’s meeting. “Every single one commended the care” at the facility, Cozzone said. Commissioners’ Chairman Terence Farrell said the county is proud of the home’s reputation but would be remiss if it failed to address the economic realities of declining state and federal health-care reimbursements. The home provides care to residents who depend largely on funding from Medicare and Medicaid. According to county figures, the home lost $2.5 million in 2010, a figure that was reduced through a streamlining initiative in 2011to $1.2 million. The projected 2012 loss is $1.4 million. Several speakers who acknowledged the dire financial straits had suggestions that ranged from petitioning lawmakers to reallocate lottery funds for elder care to exploring more energy savings at the home to gauging community support for subsidizing the home through a referendum. Commissioner Ryan Costello said he hoped the Pocopson Home employees did not feel singled out for scrutiny, pointing out that the board is constantly looking for ways to save money in all of the county’s 54 departments. “I think we all know it’s a special place,” he said of Pocopson. Conflict over the facility’s finances have surfaced before. In 1998, then-County Commissioner Andrew E. Dinniman led an emotional fight against a proposal to sell the home to a for-profit company. The following year, the commissioners blamed a tax hike in part on revenue losses from the Pocopson Home, a refrain that was repeated in 2004. More than two years ago, former County Controller Val DiGiorgio suggested the county could save money by hiring a firm to operate the facility. The Pocopson Home can trace its ancestry to the Chester County Poor House, which opened in 1800 on a 325-acres tract in Embreeville, which later became a state hospital. In 1855, the facility moved to a 305-acre tract in Pocopson. It was rebuilt as the Pocopson Home in 1951. At the conclusion of the two-hour meeting, the commissioners joined Pocopson Home administrator Alan Larson in thanking the audience for its input. Farrell urged people to monitor the county’s web site for information on the next meeting , sometime within the next couple of weeks. Asked if the location would be the same, he looked around the packed room and shook his head. “We might need a larger venue,” he said. Pocopson Home is indeed a gem, a real community including staff and residents. I use to visit my sister weekly and got to know many of the residents there. Unlike many other nursing homes, it was comfortable for families to visit and spend quality time with their loved ones. The lobby and sitting areas are beautiful and there is a garden that is perfect for the summer months. My sister begged me not to take her out of there as she had found a home where she had friends and felt safe. During her last days, the compassion and love she received made for a beautiful ending to her life. Thank you. 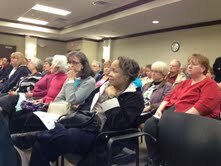 Thank you to those that attended, spoke, sent letters, and emailed the County Commissioners. Please continue to SUPPORT POCOPSON HOME- RESIDENTS and STAFF NEED TO KNOW YOU/ CHESTER COUNTY CARES! Please support this county department that LOVES to provide this QUALITY CARE DAILY! What a nice thing that Kathleen Brady Shea is writing for the Unionville Times! She is a talented reported with a lot of top-notch experience. I think the Unionville Times is the best thing to happen in this area in a long time. Keep up the good work! I’ve been to many public hearings and I cannot remember when the public was so genuinely united and so full of praise for something as I saw last night. As I pointed out at the meeting, the County Commissioners always seem to find money for the things they want like the Juvenile Detention Center built a few years ago in Pocopson, the prison expansion, the Justice Center, parking garage, etc. They need to find the money for the Pocopson Home simply because it is right.